Peterborough Panthers were the early Speedway Championship League pacesetters until they were derailed 57-33 by Workington Comets at home on Friday. 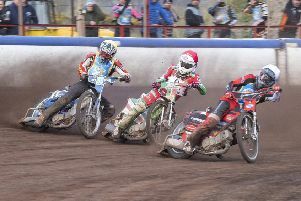 The Panthers were under pressure to bounce back quickly at the East of England Arena yesterday against Edinburgh Monarchs, who have a decent win record against the Englishmen. The home racers triumphed 48-42 but were not that convincing and Monarchs claimed a vital match point, thus retrieving the one they lost to their opponents in the reverse fixture. Promoter John Cambell said: “I was satisfied wth the point we got. Considering we only produced four race winners over the course of the match to lose just by six wasn’t a bad result. The Capital side opened up with a share of the spoils in the first race when No.1 Ricky Wells defeated his opposite number Scott Nicholls, who dominated the first match at Armadale with a brilliant 18 points. Unfortunately Joel Andersson could not find a way past Emil Grondal for an additional point. But Monarchs grabbed a 5-1 in heat two through reserves Matt Williamson and Josh Pickering after Peterborough’s Tom Bacon broke the tapes and had to start from 15 metres in arrears. Pickering rode brilliantly to keep Simon Lambert at the back. And two races later, Monarchs extended their lead to six points, 15-9 with a 4-2 as captain Erik Riss defeated Ulrich Ostergaard with Pickering claiming third spot, although Ostergaard pushed hard for all four laps. But the Panthers were quickly on the prowl as Palm-Toft replaced Bacon for a tactical substitution in heat seven and the switch paid dividends with a 5-1, Palm-Toft and Ostergaard easily getting the better of Mark Riss and Max Ruml, and this reduced Monarchs’ lead to just 22-20. The Panthers levelled the scores after nine heats thanks to a 4-2 from Palm-Toft who headed home Erik Riss and Nike Lunna who grabbed a vital point. Monarchs six-point lead had evaporated within the space of a few races, with Palm-Toft looking especially sharp. And disaster befell Monarchs in the very next heat when Mark Riss hit the deck on the second bend and was excluded from the re-run. Riss was okay though. In the restart Ruml split the Panthers pairing of Nicholls and Grondal but the resultant 4-2 for the Panthers pushed them ahead for the first time in the match, leading 31-29. Grondal suffered an engine failure on the third lap and pushed his bike round the whole track for a point, receiving a standing ovation from the home fans. But Monarchs certainly were not about to cave in and got back on level terms, 33-33, with a 4-2 from Wells, who won easily, and Andersson in the 11th race against Ostergaard and Bacon, who rode heroically for second spot. Monarchs’ parity did not last long, however, as the Panthers pinched a 5-1 in heat 12, Bacon, who replaced Lambert, and Lunna defeating Mark Riss and Williamson. The Panthers now led 38-34 and Monarchs needed to find something over the final three races to get something out of this match. The 13th heat was shared leaving Monarchs still trailing by four and the penultimate race was also shared, Panthers ace Palm-Toft beating Pickering and Ruml for his fifth win of the night. In a dramatic last heat, in which the Panthers landed a 4-2, the race had to be re-run after an unsatisfactory start. In the restart Wells’ bike stopped just as the tapes rose, but Erik Riss grabbed second pace on the line ahead of Nicholls which clinched the match point for Monarchs in nerve-tingling style. Palm-Toft won the race completing a brilliant 18 point maximum for the Panthers star and he was without a doubt a real thorn in Monarchs’ flesh. Although Monarchs’ reserves outscored their Peterborough counterparts, the Capital side still look very vulnerable in the middle order and changes may be afoot. Peterborough: Palm-Toft 18, Nicholls 12, Grondal 5, Bacon 5, Ostergaard 4, Lunna 3, Lambert 1. Monarchs: E Riss 10, Wells 9, Pickering 6, Williamson 5, Ruml 4, M Riss 4,Andersson 4.